At Olly Bobbins we are here to help you create your perfect wedding day. With over twenty years experience in the florist industry, we understand that every wedding is individual and just how important all the little details are. We are on hand to help you from initial consultation to the big day itself, and whether you are looking for a classic bridal bouquet, modern centrepieces or just for some expert guidance to match your flowers up with your vision, please get in touch. To set up your initial consultation with our head florist, please contact us on 01828 686913, fill in the form below or pop in store and let us help you create your dream wedding. 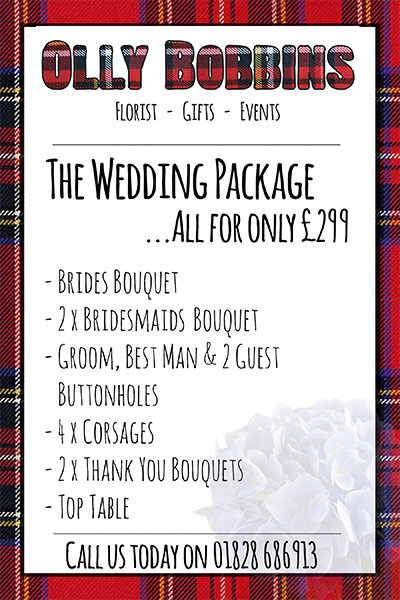 All our wedding flowers are tailored to meet your specific needs, please find below a list of guide prices for all the essentials for your big day.